Wash lettuce leaves well; dry leaves and cut edges to get cups shapes. In the 1-quart Mixing Bowl, add water, chicken base, teriyaki sauce, soy sauce and sugar. Stir all ingredients well and set aside. Add olive oil to the skillet, and preheat at medium-high for 3 minutes, or until oil is very hot. Add ground chicken, garlic, salt and pepper to taste; cook for 3 minutes, while continuously stirring. Reduce heat to medium and add water chestnuts, mushrooms, bell pepper and carrot; cook for 3 more minutes. Add reserved sauce. Reduce temperature to low, cover and cook for 5 more minutes; turn off stove. 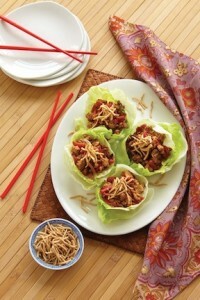 Add a portion of chicken on each lettuce cup and top with rice noodles. Serve right away.